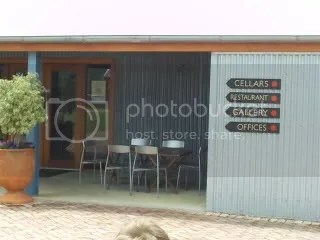 Penny’s Hill cellar door is between the towns of McLaren Vale and Willunga and can only be considered as a success story for McLaren Vale from their 1988 beginnings. A very smart set of packaging where the red dot is a take off of the sold stickers on art works in a gallery. The winery slogan – Proudly Australian – more so McLaren Vale is also clever for the overseas market. 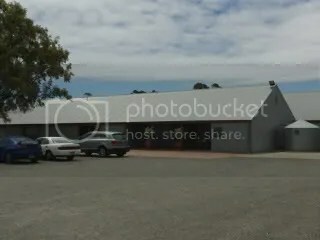 They have 3 owned vineyards – Malpas Road and Goss Corner are near the cellar door plus the Penny Hill Vineyard on the foothills east of McLaren Vale. Viticulture is an important part of the Penny’s Hill way and there is interesting practices with the aim to produce the best fruit. On this visit I missed out on the Grenache – but I am told it is a beauty, so I will have to return when I find out the next release. The cellar door complex has an interesting mix of the old and new with the original homestead next to the corrugated iron based cellar door building. Also there is a chook yard and an area for such activities as Bocce. The restaurant as part of the cellar door complex has a great reputation and if you want to check it out I suggest you book. The last few times I have been there the place has been full. Check out their web site at www.pennyshill.com.au. There is a large line up of wines to taste so be careful on how much you consume during your tasting. All the things that draw some people to this variety are here – passionfruit & gooseberry with clean acid finish. One thing I did like was dry finish combined with this good acid. It would not have surprised me if there was a few bottles of this was consumed Xmas Day with the smoked ham. Mulberries in a glass. Made from vines whose roots are spread out into the black soils on the flat between McLaren Vale and Willunga. The wine is good but not inspiring so it is not one I will be opening any time soon. The Cabernet seems to dominate this wine even though it is almost 1/3 of each variety in this blend – lots of juicy black fruits with dusty dry oak tannins. Again s good wine but just seems to be lacking something to make me want to drink it. The aromas were almost non-existent – what was there were smoky blackcurrents. The flavors were up front blackcurrent sweetness with just a touch of smoky oak and the dry tannin finish. Again a good wine but just something missing to say it was one I would want to take home with me. The Cracking Black refers to the Bay of Biscay soils that the vineyard is planted on – when dried out these clays often crack on the surface. These soils must provide a good basis as this wine had the spark I was hoping for from this stable. Typically plum aromas with a hint of fairy floss (or cotton candy). The flavors had juicy fruit and American oak (almost coconut) sweetness. There was a denseness here that my notes just defined as “Black”. I am thinking of the charred meats of the good old fashioned Aussie BBQ. There is only one way to describe this liqueur – marzipan with a strong alcohol tingle in a glass. Made in a similar way as Limoncello where crushed almonds and sugar is added to alcohol. This one will divide the masses you will either love it or hate it! A small shot during winter to warm the senses with those that love it would be the way to go. This is the real deal and is worth every cent for this 500 mL of Barossa magic – yes this 20 year old fortified wine is made and matured in the Barossa. It is so good I did not even care it did not come from McLaren Vale. The aromas have an alcohol tingle that you would expect mixed with dates and toffee. The flavors have the same toffee & dates plus combined with the nuttiness of cashews – and ooh so smooth. I can see one being consumed while sharing it with your loved one, during the cold months of winter and eating a plate full of great soft cheeses. Little aromas combined with slightly bitter passionfruit flavors just strengthens my view that even though wine labeled as Sauvignon Blanc sells, it is not always a good wine. Some light fruit on the nose – so light I could not make out what it was. The flavors were a mix of passionfruit (somewhat different for Pinot Grigio’s I have tasted so far), pears and acid minerallity. As the wine is on the light side, I think this is more of a Sunday afternoon wine to be consumed with friends, more than a food wine. The wine shows a trend for wineries that produce Viognier – co-fermenting Viognier skins with red grapes (in this case Grenache). A blend of 50% Grenache, 45% Shiraz plus 5% Viognier. The result shows some lifted red fruit aromas that transform into red fruit sweetness with apricot flavors. The apricot was a tad too obvious for me. The wine represents good value if you like the it’s apricot nature. The wine has about 6% Viognier – the winemaker seems to like the Shiraz / Viognier as it appears across the whole range (including Mr Riggs wines). The wine showed purple tinges so I thought straight away I thought was there enough acid in this wine. The alcohol tingle on the nose indicated a reasonably high alcohol level. I got bitter plumy apricots flavors which were not appealing – so a big leave for me. As some of you will know I like this style. This example is a sweet plum bubbly infusion. A wine that is not too serious and is easy to drink – and at this price why not. This entry was posted in Mclaren Vale, wine and tagged Adelaide Hills, Australia, Cabernet, Cabernet Sauvignon, cellar door, Chardonnay, liqueur, Mclaren Vale, McLaren Vale Wine, Sauvignon Blanc, Shiraz, wine, wine McLaren Vale. Bookmark the permalink.